Well I am really into painting for my shows now and this one small 8x10 canvas is a very new pattern I found and purchased from the " NEW blog" Terrye French set up called Painting with Friends. 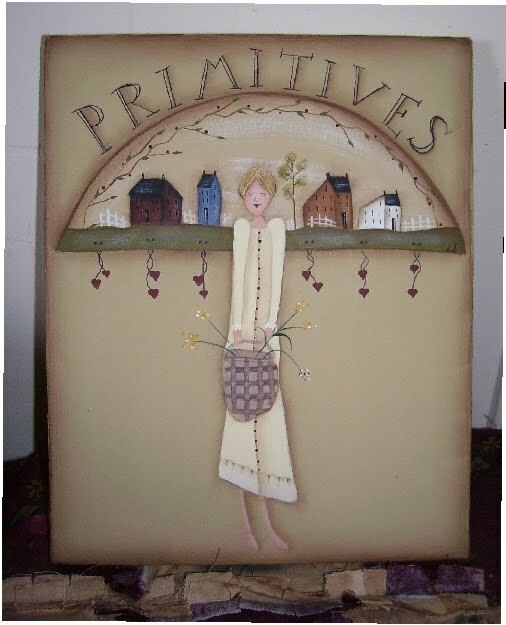 Terrye has been one of my favourite artists for Prim and Whimsical designs over the years I have been painting. Launching this new blog of hers is helping to promote those who love to paint her designs that she has created. Terrye sends the line drawing to another artist and she paints it then Terrye and the artist share the profits of the e-patterns sold. My friend Marie is one of the painters and has a few patterns already set up on this blog. Anyways to make a rather long rambly story short I have a design I saw that I really liked and thought I would paint it on this canvas. I actually painted 2 of these so I would have some extra stock. I also have a couple more designs to do but I am just finishing up another small skinny sled and some Memo jumbo clothespin clips.I will post a pic of those in my next post. Anyways if you are looking for some fun and primmy things to paint and want some hot off the press patterns, well E-patterns go take a peek at Painting with Friends, all the information regarding how to purchase them is right there on the blog. Thank you Jen and Marie. I have more goodies on my table, just wish I was faster and didn't need to sleep. Love it Lesley! I don't sleep... somtimes I'm still up at 3 AM! I can never shut the brain off!!!!! !I'm in full fall mode now of painting! It's good to see you painting again!